Bacterial cells that normally colonize our guts can distinguish themselves from other bacterial species using what’s traditionally considered their enemy — a virus. Researchers report April 16 in the journal Cell Reports that some bacteria use viruses that have infected them (i.e., phages) for self-recognition and thereby show greater fitness, repelling competitors that lack this adaptation. The idea for the study began when Wood and his team noticed a demarcation line that formed between different Escherichia coli K-12 strains, but not between identical clones, as they swam toward each other. To investigate the underlying mechanisms, Wood, first author Sooyeon Song of Pennsylvania State University, and co-senior study author Xiaoxue Wang of the Chinese Academy of Sciences screened the swimming behavior of the complete E. coli K-12 library of 4,296 single-gene knockouts. They discovered that the demarcation line completely disappeared for only one mutation affecting a gene that is required for the replication of some phages. The findings suggested that phage-related proteins are responsible for bacterial self-recognition. 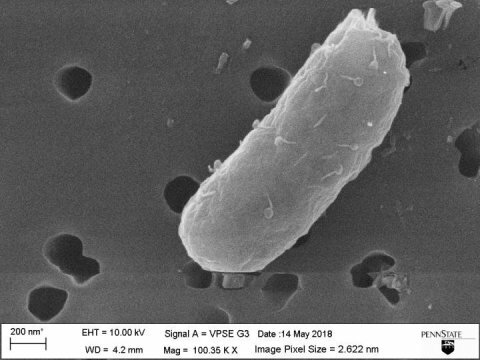 Consistent with this idea, the researchers found that the demarcation line was also eliminated for an E. coli K-12 strain lacking all nine cryptic prophages — bacteriophage genomes that have integrated into bacterial chromosomes but do not form active phage particles or rupture (“lyse”) their host cells. In particular, additional experiments revealed that the cryptic prophage CPS-53 and one of its proteins, YfdM, were required for the demarcation line. Since CPS-53 is essentially inactive in terms of cell lysis and phage-particle production, the researchers suspected that the demarcation line is formed through cell lysis caused by a different, active phage. They found that exposing bacterial cells containing an active lytic phage called SW1 to YfdM stimulated the production of phage particles and caused the lysis of cells, primarily those lacking SW1. Greater concentrations of YfdM or phage particles produced thicker demarcation lines between bacterial cells. The findings suggest that SW1 controls the formation of the demarcation line by using one of the host’s cryptic prophage proteins, YfdM of CPS-53, to propagate.